Your Chicken 65 looks wonderful. Thanks a million for sharing. This is one of the recipes that I can never get quite right. Maybe, I'll follow your recipe and give it another try. Is curry leaf the same as bay leaf? We have something called 'Tej pata, is that the same thing? Could not agree with you more on the nail paint thingie. I mean the same thing if presented by some other example may have made more impact or so I think. Thanks for the recipe as I have chicken sitting in freezer and was wondering what new to do. BTW, I tried your chicken kebab recipe recently. Made some tweaks but it was awesome. No, no curry leaf is VERY different from bay leaves. Can not substitute one for the other. Where are you ? Can send you curry leaves if you are in the US. What kabab ? I have a chicken kebab recipe, where ? nail paint thing is well said, in India though you see so many versions of so many things that at one point you will loose your track on right or wrong! I'm so bummed, I wrote a big comment and it didn't go through. The toenail and making little kids think they have to augment to feel good gets to me too. As for this chicken 65 all I know it tastes great and your version has to be repeated very soon in my kitchen. Oh, my bad ! Here I have gone through half my life thinking curry leaves and bay leafs are one and the same, food illiterate that I am ! Well, I googled it and found some pics, so now I know what to look for. Everybody assures me its readily available in Indian and Chinese groceries. But thanks so much for offering to send me some; you do show a lot of commitment to the followers of your blog ! THANK YOU ! Sandeepa : Indian style chicken meatball. That is what your post read. Basically same mix of chicken diye I made burgers, kebabs and bakes meatballs for gravy. Is there a substitute for Chilli garlic sauce for this recipe. Have none at home right now. Will just hot sauce do ? Probably not. My mom never cooked chicken- because she simply hated! I learn the Chick 65 with one of my aunty! ur version is totally different and looks delicious! As for kids and pedicure, I just feel sad. Kids need no make-up, no jewellery and certainly no manicure/pedicure. They are so divinely beautiful, first thing in the morning. Why do their parents allow them to do this! You are right. Though I do not have a daughter and always I wish had one to share my stuff in my dressing table...not that I have loads of make up things,yet I wouldn't like any little angel with nail enamels and lipsticks or any other facial getups. 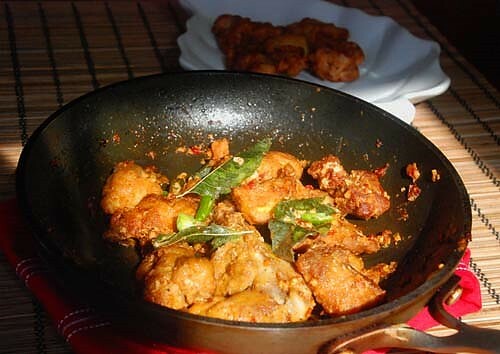 Chicken ..love it, looks perfect and yummy!! I tried your new version of chicken 65 last night.It was a glorious success. The hindsight is i got to taste just a wee bit as my 10 yr old on gobbled up the rest. I note to incraese the quantity next time. Thank you so much for the recipe. In fact had my maid andson not seenme cook the stuff, i could easily have passed it off as a product of a posh restaurant. Thank you once again. Mouthwatering recipe. Nice one... Want to give it a try. YUM! 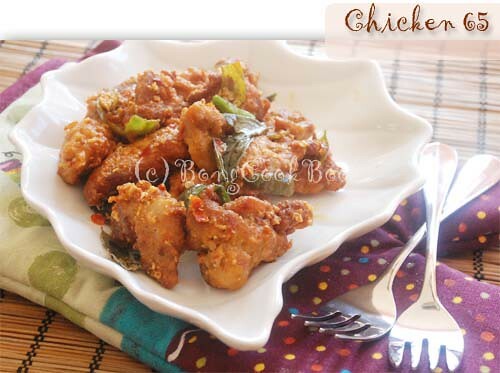 Chicken 65 originated in Madras in a hotel called 'Buharis". Buharis was a landmark in Mount Road and the best place in 60's to 80's for non vegetarian Indian and continental dishes. The menu listed the items serially and they insisted on specifying the serial number of the dish while ordering. Chicken 65 was morsels of marinated Chicken deep fried and served with a mint chutney and sliced onions. This signature dish has since been replicated throughout the world. I also understand that 'Buharis" is being relaunched recently. Ah, when little girls like to play grown ups or vice versa. Always makes for interesting discussions. I am totally with you on this, and yes, I too own one nail color, from six years ago. As to your Chicken 65, first Manisha with her chicken tikka and now you. Between the two of you, I have to make some chiken bites even if it mean scrubbing and cleaning the sink and dishes with bleach afterwards. 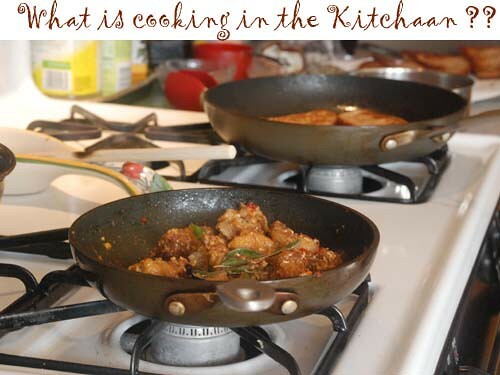 I liked your recipe - its simpler and tastier than most versions I have eaten Sandeepa . Kintu onnyo pan ta tey ki fry korchhilay - begun bhajaar moton ? Nice recipe. I want to make it for dinner tomorrow. Just curious...I wanted to serve it with naan, but I feel it's a very dry dish. Would fried rice work better? Chicken 65 is more of an appetizer kind of dish. Will not go with Naan. Thanks for inputs, it was really nice to hear everyone's point of view. Now, horror of horrors, my 7 year old has been invited to a class mate's b'day party at a place where guess what, they do mani-pedi-makeovers !!!! I had no clue about the place until I looked up. Should we drop in, wish the b'day child and make our excuses to be back home OR should I let the child be at the party but refuse the services ? 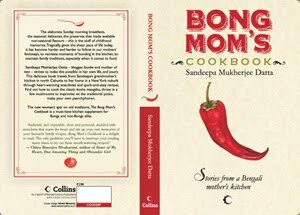 Sandeepa - I just realised I have been reading your blog for over 4 years now :) And the old Chicken 65 was the first recipe I tried off your blog. I went to that post now and found my comment from back then, and your reply! This sounds as good as before - will try it. Thanks. Much amazed at an associated article with this great site ..'how to clean a Bong? '.Though it does not take away anything from the merits of the ever-delectable 'shukto' recipe and fab pics herein. Just saw this post while going through your blog and I'm very curious about what you did for the birthday party. Did you let your daughter stay or did you leave the party early? I must admit that since this post I have opened up more and do allow nail paints on the toes for my 8 yr. old on occasions :-D I think I have realized I need to pick the right battles. Hi Sandeepadi, I am huge fan or yours and an ardent follower of your blog. I made this Chicekn65 dish verbatim from your blog and it was a huge success. Actually it got finished before i got a chance to taste it......so a big THANK YOU to you!!! !